I re-discovered this jumbo size cookie over the weekend. Years ago it was my favorite oatmeal cookie recipe and quite popular with friends and family. People requested the cookies often, but after a while I got tired of making them and moved on. Yesterday, still in an oatmeal cookie mood and wanting to use up some coconut, I made a batch of the toasted coconut cookies and remembered why I liked them so much. These cookies are thick, dense, and sturdy enough to hold big chunks of good quality chocolate. For this batch I used Lindt because their “Intense Chocolate” was on my mind. As for the oats, “old fashioned” or “rolled” work best. I made these with the “quick” (not instant) type and while the cookies were good, the texture was sort of mealy. Toasting the coconut adds some extra flavor, but if you skip that step the cookies will still be great. In fact, the original recipe from Gourmet used plain coconut and roasted almonds. Toast the pecans and coconut. For the coconut, spread it on a rimmed cookie sheet or in a large baking pan and set it on lower rack of oven. Arrange the pecans on a second sheet and place on middle rack. Bake both pans together for 8-10 minute, checking and stirring the coconut every 3 minutes or so. The pecans should be ready in 8 minutes and the coconut will be ready when it starts to turn golden around the edges. If baking cookies right away, raise heat to 375 degrees F.
Using about a 1/4 cup measure, scoop up dough to form mounds. Chill the shaped balls/mounds until ready to bake. When ready to bake, arrange mounds 3 inches apart on parchment lined sheet, press down to about 1/2 inch and bake at 375 for 12-15 minutes, turning once. These cookies go from pale to overcooked fairly quickly, so remove from oven when edges are browned and centers are still slightly pale. Mine are usually done in 14 minutes. Variation: Use unsweetened coconut in place of the flaked coconut and almonds in place of pecans. Sheila, yes. I’ve made these as smaller cookies and they are okay. The bigger ones are better for some reason, but if you make them small just use 1 1/2 inch balls and bake for 10-12 minutes. Wow those look fabulous! I’m a big fan of adding coconut to cookies, it add such nice chew! Do you think this will work as smaller cookies? I know for some jumbo cookie recipes…making them smaller results in a different texture. Thanks! These look amazing!!! I love coconut and oats and chocolate — thanks for posting! Those big chucks of chocolate make these cookies look very tempting! Thanks for the recipe! Yum! I have to try this recipe. This cookie reminds me of my favorite jumbo oatmeal cookie from America’s Test Kitchen, Chocolate-Chunk Oatmeal cookies with pecans and dried cherries. I normally swap out the mix-ins to suit my mood. If I add about 3/4 cup sweetened coconut, I reduce the amount of brown sugar called for in the original recipe by a 1/4 cup and add only 1 cup. Yum! I’ve done coconut oatmeal, but I’ve never added chocolate. These look and sound like a cookie I would LOVE!! Mmmmmm! Wow.. seriously, I really ghace to make these ones! you know i love jumbo cookies. and coconut!! Wow, those look good! 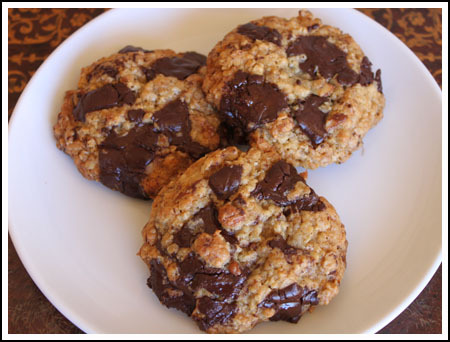 I love oatmeal cookies, but being a raisin-hater, I prefer them with chocolate! Oh my gosh! I seriously want some of these right now. I just finished off a couple of Oreos while I watched my brother eat big fat homemade cc oatmeal cookies… so jealous.